Tim Byrne is a writer and illustrator of books for children and young adults and a digital technology expert, currently a senior project manager at Macmillan cancer support. He was a primary school teacher, ITC co-ordinator and gifted and talented advisor in schools in Lincolnshire and South West London between 1995 and 2008. He has also written a range of education content for BBC Schools and worked as a digital advisor and website manager for the National Literacy Trust. The first experience of school I can remember is of an outside space that was built on the side of the primary school. It was a covered play area where people could play when it was raining, walled in with planks. It was cold like an outdoor space, a large channelled warehouse where you’d line up to go into pre-infants. It was very noisy and it felt like being herded into pre-processing for a meat-packing place, very slaughterhouse-like. But there were hula hoops (laughs) and there were toys to lure you in when it was time to line up but then the gates would close behind us. Were there any places in your primary school that you particularly liked? I found a space that wasn’t technically out of bounds, but depending on who saw you, you could be told to leave it. It was a courtyard and I remember going there with two friends. It was walled off and about as big as a couple of rooms, and I remember scratching lots of different ideas and designs for stories on the floor with a stone. It was a really interesting space, but I remember thinking it was best because there were only a couple of people there. How about a place you disliked? 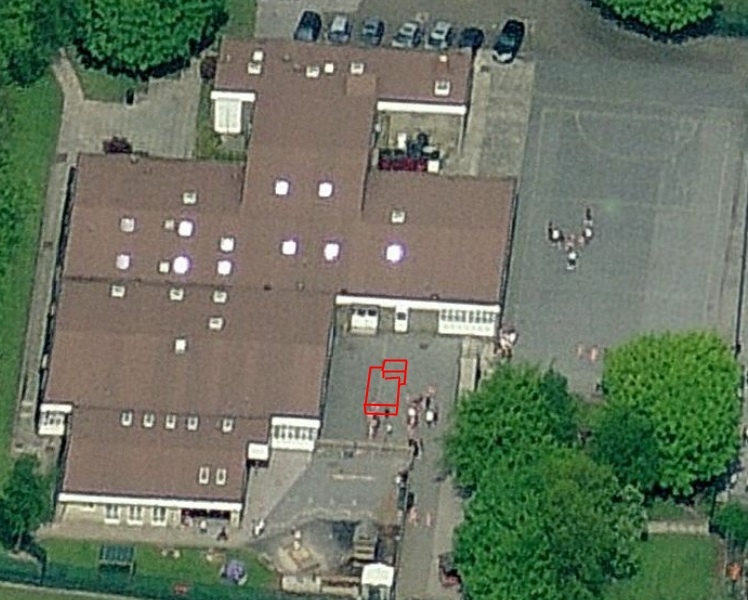 The concrete slab was here (in red). What was the inside of the school like? The school was a 1970s building that looked like it had been prefabricated, thin panels, big glass windows down to waist height. It was very noisy in the open-plan classrooms. You’d be gathered together to get an input and then you’d be split off to go and work at tables of four. You’d sit at your table and work through whatever had been given to you. The tables were close to tables from other classrooms so there’d be a blend of people there. And there were craft areas that were used by small rotations of people, one of which I was given private rights to in Year 6 to do mad experiments in by a rogue Year 6 teacher. I don’t know what he thought I was doing there, but I thought I was trying to make a dye-laser out of clothes dye and plastic tubes and a torch! It was far from a clinical environment, but I had an idea and I was pursuing it and there was a topic display created at the end of it (laughs). But yes, those spaces were all over the place. There was a library that nobody ever went into, apart from when you were younger you were marched there as a class and it would be like ‘Eight minutes, choose a book!’ while 30 other children were trying to choose a book, so you’d navigate by bright colours ‘Oh, that looks fun, it might have a cartoon in it’ and then it would be discarded when it didn’t (laughs). How did the teachers organise their space in the open-plan classroom? Early on I remember them having desks, but I don’t really remember where they were further up the school. You didn’t go and find them, you worked at your desk and they sort of flitted around to you. So I neither knew nor cared where they were doing their stuff. I think they had desks, but they didn’t have desks facing the class, they had desks facing the wall where they piled their stuff while they got around to dealing with it. So when you went to teacher training college, were you being trained in that same model as your primary school? Yes, very much. I went to Bishop Grosseteste, which at that time had been designated as the National Primary base and they began the teacher training with – it was quite ideological – ‘the starting point book’ where you’d take an object and you’d do every conceivable maths, science, art session around that object to give you a sense, as a prospective teacher, of how many ways you could get a child to learn based on a particular idea. I chose an autumn leaf and filled a ‘starting point book’ with that. In all the activities that we were encouraged to do, the learning was the focus, not the activity, so any activity that would encourage the learning was what I was being trained to look for. Were you specifically given training to use the classroom space in order to teach in that way? Never. It was all about the process. A lot of it was about giving prospective teachers the broadest possible range of different activities to choose when designing what an appropriate learning activity would be for a class, a group or an individual. It was very oriented towards differentiation so you could choose different activities to teach the same thing. There was nothing to do with teaching spaces, apart from displays, which there was an enormous amount of input into, and it was usually about a pseudo-science of graphic design, about getting the edges straight on display boards, the internal and external edges and images lined up, and the value of double mounting something with two different coloured borders to really show the children that you valued their responses, whether or not they valued them. There was a lot about trying to invest value in what the children were doing. How did you set up your first classroom as a teacher? My first classrooms were incredibly creative (laughs). The children’s desks were mostly facing out of windows. I had windows all the way around the classroom and nearly all the desks looked straight out of the windows. I thought it would be nice for the children to have a good view. And there were strange, bespoke archipelagos and isthmuses of desks that stood out, linking these in creative patterns with a massive carpet area in the middle of the room: the room was more like a big space with desks around the edges of these big windows. I was very proud of that. What did the other staff think of this classroom design? Absolutely nobody knew or cared what I did (laughs). It was a three-form entry junior school and I worked with two colleagues in my year, one of whom was a deputy head and the other a grandee of the school, both of whom taught in a very traditional manner and thought I was quite mad to do anything other than line the children up and position the noisiest children in areas where they could be influenced. It didn’t go badly at all. Did you replicate this design in other classrooms? I tried many different designs and frequently rearranged. The problem was, more and more, that I needed to give a stimulus to children to focus them in on some learning and when they were all facing away from anything I could ever give them as a stimulus to look at I was forever giving out and copying a hundred pieces of paper to give to them. So my later classes were focused on a central place where we could come together and focus on a model that was common to them all but could be addressed in a number of different ways. So some people had a model that had lots of support and others had a lot of freedom but a lot of challenge. What I valued later in my career was the ability to share emergent properties that had come from the children. So I’d pitch something that they could work with in several different ways and I’d sit down with a group and it would become apparent that my pitch would be limited in one way or another way and then I would tweak it. I would often demonstrate how I’d approach solving the problem myself to give the class a way into it and that never restricted anyone but they definitely gave their own responses to it. I’d give a model of how to respond to the broadest task. And then people ‘higher up’ could do something much more stimulating where they would need to meet the brief I gave them but with added layers of complexity. I found that gathering everyone together in one place in the classroom to make those tweaks and working on a common idea would give the whole group a way engage with the idea and get the most out of it. How did changes in computer technology affect the school buildings where you worked in the 1990s? I built a computer room in my second teaching job, in a school where I was the ICT co-ordinator, because I could see how effective it was to work with a group where you’d give a demonstration, look at the ideas together and ask people to work on that idea, and not just use whichever piece of software was available. The software is not IT. IT and ICT is all about solving problems and working towards goals by using technology. Most teachers didn’t do that, they took teaching software and allowed the children to play with it. The creation of a computer room meant that you could teach children to engage properly with wider issues. I wrote a curriculum based on the national curriculum. It was very ambitious at the time. And I didn’t opt for all the packages you could buy, if we’d spent all of our money on that we’d have got eight computers, but we bought fifteen. I networked them myself and I was very proud of that. It was also very unusual to have a computer in each classroom networked across the school and connected to the large screens in the classroom – screens as they were when I started in schools and smartboards when I left. You could demonstrate things in the classroom and then go into the network room and everyone could do it together. It was in a converted corridor, which wasn’t ideal but it was the best available. There were long benches with one computer between two. Later on we built a computer room with one computer for each person and that was actually more problematic because there was no discussion so when someone got stuck they would interrupt the person next to them, who wasn’t usually working on the same thing. How important is the interactive whiteboard in terms of classroom space? I found that interactive whiteboards were a real influence on my classroom design because immediately they gave me a facility to communicate visually, which was much better than if you had to write or draw everything. Before interactive whiteboards came into classrooms there were overhead projectors, but with the whiteboards you could type in some text and keep facing the class, keep engagement, keep interacting and have the class and the screen in your visual field. And that meant that there could be a real conversation and enhanced the amount of feedback that I could give. Having that window into an environment that is very information rich, flexible and easy to manipulate was very different. Should architects design classrooms with the whiteboards in mind? I’d say that the interactive whiteboards are the single most valuable, powerful tool at the heart of the classroom. I had the first one when it came into the school from their introduction and my opinion is that it is absolutely essential. The notion that everyone should be looking down at a little tablet, even if you take control of all those tablets to try and demonstrate something, takes all the value out of it. I’d rather have nothing in the children’s hands and a chance for everyone to draw their attention together to get a group narrative of what’s happening than trying to follow something independently on a tablet. I’ve seen lots of theories about children doing the learning at home and then coming in to solve problems together and that’s great, except that re-engaging with the context of the lesson is absolutely core to good practice. How are you going to re-engage people who have learned things at different times and places? Why not make it scalable, why not make it so that your teacher interventions are helpful to the most number of people? And that means gathering together a group understanding of what’s going on so you can solve problems together and come to a way of articulating things together. I learned an enormous amount about the subjects I was teaching because of the way children questioned and talked about things. I would say that a shared place of communication that people can join in with facilitates all of the value, it really gives you a space to think together, to match where the children are at and learn with it. But if you don’t join together or have no shared context for what’s going on, people can very quickly get lost and lose the value of what they’re doing. If you could change one thing about schools overnight? I would change assessment. Wrangling over assessment wasted an enormous amount of my time when I could have been interacting with children and helping them. I don’t really believe that much of that assessment ever helped anyone: it was about demonstrating progress to those who wanted to audit it. I had children in my class who would perform in one way on one day and on another day would perform in a radically different way. I was often told to moderate my assessments for a child so that the assessment would be more in line with what was expected of that child. Sometimes they were completely anomalous because of the inputs I’d given, which were specifically tailored to help them engage with a particular skill-set and it turned out that they could do that very well. The spirit of the testing process meant I was often asked to carry out a kind of ‘levelling’ that would allow teachers to rank the children’s ability over time. So if my assessments came out too high because of the way I’d tested the children then it could make life very difficult for their next teacher if the children couldn’t keep those levels up. The whole assessment process seemed to be quite backwards and about constructing a narrative about how the different children’s abilities were developing in a linear way, when I found their abilities to be incredibly inconsistent depending on different contexts, the same as you would find with any adult. I don’t know what value there is in assessment. For qualifications? I now work outside education, in digital technology, a highly creative, complicated field but there’s no requirement to have a degree to work in my field. If you understand it, then you’re who we want. And it’s my job when I’m hiring people to find that out. So assessment, I’d ditch the whole lot of it, why not? What good does it really do? There’s an argument that it stops people getting left out but (pauses) well, if people were getting left out I’d worry, but ditch assessment and everybody can just teach and learn together. You designed a programme for ‘gifted and talented’ pupils in the final year of primary school to deepen their experience of problem solving by engaging with architecture. How did that work? This was an enrichment model to help children engage with real-world problems, which would require a complex response to solve. The school where I worked had a teacher who had been a practising architect and there were also parents who were architects. I chose a project title of ‘building for the environment’ as an interesting challenge, although as I moved through the project I found that this had a level of complication that wasn’t really necessary and just designing a building was complicated enough. Eliciting and defining a brief was crucial, so I focussed the activity workshop day around a brief based on a family home. The brief consisted of statements from the four members of the family and there was also a family dog (who did not have its own statement in the brief) and all the family members had different needs. This information was sent out beforehand to the participants from schools across the borough. They were asked to undertake a mind-mapping activity to break down what the different spaces in the house might be and how they might be relevant to different people in the house. There was no template house or materials specified, only features of usage. Then they were given 3-D models of buildings designed by famous architects, with Wikipedia entries as a stimulus, so they could explore the different designs with their brief in mind. Finally they were given access to a free piece of modelling software to create an outcome. It was an interesting experience but effectively the quality of the responses was … well, they all looked like houses but everyone was very unclear about whether it would be good to build those houses. So the responses weren’t what you expected? They had an experience but they didn’t achieve a completed design or if they did, they couldn’t tell whether it was good or bad. Based on that experience, if children were to be more involved in school design, how would you take what you learned from that workshop forward in terms of pupil participation? My experience of that day is that trying to coach children to act as specialist designers kept prompting them to look for guidance from specialist designers. They felt they didn’t have a context for their response, they were unsure of what they were doing and they didn’t feel comfortable about what they came up with at the end because there was no way of judging it. It was a complex problem and they were trying to act as architects, but it was very difficult for them to separate out what the best fit of the brief was compared with what they wanted to design. And they couldn’t conceptualise the process? It was very difficult for them to do so. They were looking for a correct response, for how to correctly participate and so they fell back on the brief and on responding to it. They were looking for a right answer. And these were the ‘gifted and talented’ children who we were trying to encourage to look for a range of answers, but they didn’t have the range of experience to act as a designer. Usually there was a room for each character in the brief; rarely did they design shared spaces because they didn’t synthesise the information: they broke it down. They designed separate features to respond to every single perceived need rather than combine them because they had no way of engaging with what would be a useful constraint on that design and I had no way of conveying that to them. When they were in the context of acting as architects, they were drawing on their understanding of learning environments but they found it difficult to generalise that or to design something that met several needs simultaneously. Do you think this model would have worked better if you had used the workshop to elicit an expression of the children’s preferences for a design? This was a very different exercise from asking for preferences; it was about asking them to act in the role of an architect and they felt ill-equipped to act in that role, even with a lot of support and a wide array of options and clear brief. If I was running a workshop to encourage children to express their preferences for a design I would use them as providers of primary evidence of what it’s like to operate in different learning environments. I would not ask children to act as designers but as contributors to a process. I would ask them to describe features of buildings that they have found useful for their learning. I would ask them to talk about their experiences rather than imagine the needs of a multi-purpose building. I would use them as a primary source of evidence because they have experienced being in learning environments. Do you think children should have some say in the design of their school? I can see why children’s voices would not be elicited in designing a school but it would be great to hear the voices of children as people who are very important users of that environment: what has affected them positively and negatively and whether there are changes that could be made to accommodate them better. As a transient population, they’re only there for a few years and never experience it the same way from one year to the next. I think it would be wrong to take the response of only one class as they’re places of constant change. How could the architect respond to this testimony from children? My experience of schools is that they are highly individual organisms and the environment tends to reflect the culture of the leaders of that school and the community. So I would seek to elicit personal narratives from everybody involved and have openly accessible archives that can be referred to by architects as they mould a design: they could reference back to those inputs to help everyone understand what’s going on and reflect on it so that it could be an open and inclusive process. The advantages could be huge: the blindness that non-specialists have to something that’s being designed – they’re building something, it looks right on paper – this could be a way of having a rich dialogue; it could give a way of supporting the architects, their designs wouldn’t need to be ‘sold’ back to the clients because you could track back to where the need is coming from; it would reassure the community and give a voice to parents about how they interact with the premises, the teachers and the staff; and it would give a voice to all the participants involved that the design could reflect. But like any body of evidence gathered for research, I wouldn’t want to prescribe how it would be used.